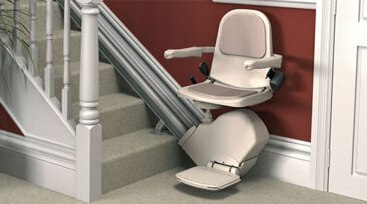 The Acorn Superglide is the most popular stairlift model. It is a straight stairlift designed for personal use in domestic conditions. Due to the great number on extras Acorn provides for the Superglide it is extremely versatile and will accommodate the needs of most customers. This straight stairlift model can be easily customized as Perch Stairlift, Sit and Stand Stairlift or even as Outdoor Stairlift. The Acorn Superglide straight stairlift is relevantly easy to install and remove. The installation of the Superglide will not damage the walls in your home. The stairlift fits to stair treads not to the walls. While stairlifts from other makers are equipped with four to six rollers, the Acorn Superglide stairlift features eight chassis rollers, giving a four times greater surface contact area. Combined with the unique double-tube rail profile feature they provide the most luxurious stairlift ride presently available. • Acorn Superglide straight stairlift is easy to use. A lot of thought has been put into making the Superglide user friendly. With the supplied two remote control handsets the stairlift can be sent or called up and down the stairs.This is very convenient for a household where more than one person needs to use the stairlift. The device operates on DC power which greatly reduces the noise level and makes for a ultra-quiet and smooth ride. The soft start/stop technology prevents the stairlift form jolting or swaying at the start or finish of its journey. The diagnostic digital display provides valuable information for the operating status of the stairlift, gathered through the self-diagnostic the device performs regularly. • Acorn Superglide straight stairlift is safe to use. The Superglide meets BS5776-1996 and it is additionally TRL and EMC certified. The 24 Volt DC operation eliminates the risk of electric shock. The dual electronic and mechanical braking systems is an essential standard safety feature the Acorn Stairlifts are fitted with. It prevents the stairlift form an uncontrolled descent. The lockable isolation switch ensures that the stairlift always stops in the right position. Other safety features include pressure-sensitive safety surfaces, limit sensors, safety belt, and lockable swivel seat. • Acorn Superglide straight stairlift is easy to maintain. The Acorn Stairlifts are individually built and factory prepared to the dimensions of each staircase provided by the installation technicians. This makes the installation quick and easy. The maintenance free batteries eliminate the need for complicated wiring and certified electrician to connect the stairlift to the power greed.